Forgive the headline; I could not resist. A skull from Frombork cathedral in Poland has been identified as that of revolutionary astronomer Copernicus. “The two strands of hair found in the book have the same genome sequence as the tooth from the skull and a bone from Frombork,” she says (AFP). See this article from The Guardian for more details. I love this story, not least for the connection of books to a kind of immortality: we make and leave parts of ourselves in every book we read. This is a big, big deal for anyone who likes to think about how the way we think now took form. Tim F.of Balloon Juice sent notice of this story to me, and for him, it is the connection of Copernicus to Galileo that has the most resonance; Galileo’s defense of a sun – centered cosmos in the face of official Catholic rejection of Copernicus’s idea marks for many the birth of the modern sensibility, the assertion of the authority of experience over revelation. I think that’s right — or at least, that seeing in and around Galileo one of the major steps towards the modern idea of science is certainly on target. But Copernicus himself holds my attention here. It is almost impossible to state how significant his combination of insight and rigor was in creating a Copernican “party” amongst the learned of Europe. It was that impact that gave both license and direction to the ongoing and expanding European inquiry into nature, an effort that over the next 150 years became a scientific transformation so total that there was not going back. There is one best place to trace how that which I am misleadingly calling a party took form. It comes courtesy of the near-legendary Harvard historian of science Owen Gingrich, who has carried on a decades long love affair with Copernicus and his book, De revolutionibus orbium coelestium (On the Revolutions of the Heavenly Spheres). But I owe him a greater debt of gratitude for his The Book Nobody Read, his tale, part memoir, part brilliant intellectual history, of tracking down every extant example of the first and second editions of De revolutionibus… and analyzing who wrote what marginal notes in each copy. In doing so, he reconstructs the path Copernicus’s ideas took through the learned of Europe. It’s a great read, a great glimpse of what it means to have a revolution in ideas at the level of individual thinking, feeling human beings exhilarated by a new thought. (My own encounter with Owen’s book led me to grab the opportunity that came when I visited the Newton scholar Scott Mandelbrote at Peterhouse College, Cambridge. Scott is or was at the time the man in charge of Peterhouse’s library, which owns a first edition of De revolutionibus. At lunch the day we met the topic of Copernicus came up, so he incredibly kindly took me into the library and pulled that treasure off the shelf for me to pick up and turn the pages. Images: Teothor de Bry, copperplate portrait of Nicholas Copernicus, 1598. 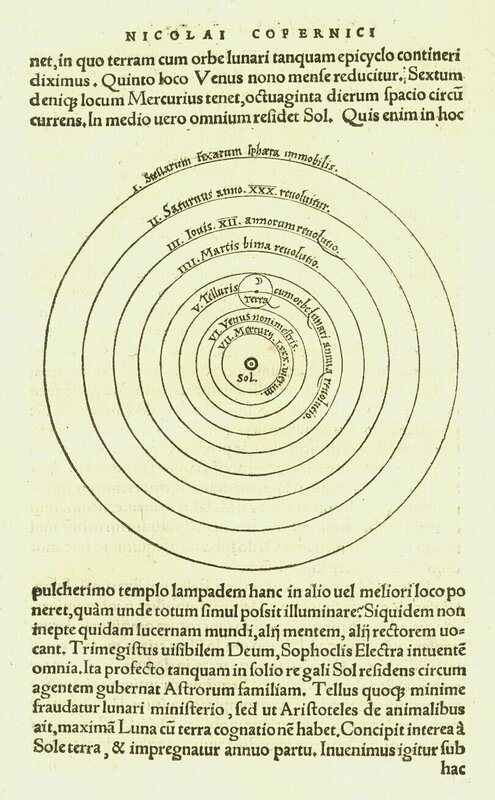 Nicholas Copernicus, diagram of the heliocentric system from De revolutionibus orbium coelestium, 1543.